Five years after ascending the throne in 1702, Queen Anne united England and Scotland and became the first queen of modern Great Britain. By the end of her reign, Britain had emerged as a major power; the victories won by her general, the Duke of Marlborough, had humbled France and laid the foundations for naval and colonial supremacy. But while the Queen’s military was performing dazzling exploits, her own attention increasingly rested on a more intimate conflict: her passionate and tormented relationship with Sarah Churchill, the beautiful Duchess of Marlborough, whose scathing wit and personal enmity have long distorted our view of Anne. Award-winning biographer Anne Somerset has drawn extensively on royal archives and previously unpublished material to create a riveting reassessment of a shy, overlooked monarch—one who was both shrewder and more fascinating than we knew. 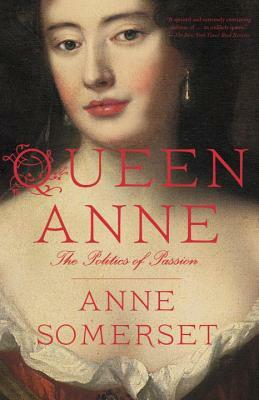 Anne Somerset was born in London and graduated from King’s College, London. She is the author of The Life and Times of King William IV, Ladies in Waiting and Elizabeth I. She has worked as a research assistant for several historians, among them Antonia Fraser. Somerset, the daughter of the 11th Duke of Beaufort, lives in London.